There isn’t one type of fishing line that is perfect for every situation. Each type and brand has their own strengths and each is suitable for particular lures, presentations, and conditions. If you are reading this, then you are probably interested in finding out which type of line is best for your particular fishing style. The interactive chart of fishing lines below and the detailed breakdown on a few specific brands will hopefully help you find the best fishing line. Everyone has their own preferences on what they are looking for in line, but I hope that the info we provide below will help make those choices a little easier for you. There isn’t one line out there that is going to be perfect in every situation. It just doesn’t exist. 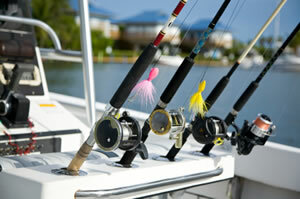 Instead, you should consider your fishing situation and goals when determining what the best fishing line is for you. For example, if you are a semi-serious fisherman who is bringing an entire army of rods and reels out with you, then you probably have the means to be able to spool different types of line on different rod/reel combinations to give you a setup that is perfect for a specific lure or presentation. On the other hand, if you are bringing one rod out there with you, you should find a line that is best suited to the lures you use most often. Are you flippin’ and pitchin’ into heavy cover? Braided line is probably for you. Deep diving crankbaits? Spinnerbaits? Fluoro is probably a good fit. Topwater? Finesse fishing? Some light test mono will do the trick. 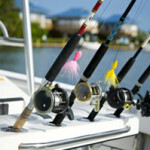 Again, find the line that suits your fishing style – thats the best fishing line for you. Almost all of the lines above are fantastic lines, and each one excels in certain areas, but I think its important that we take a look at a few of my favorites. These are lines that I have spooled up on many of my own setups, setups that have caught me hundreds of fish! So grab your reel, lets dive into our Top 3. This line is extremely easy to use, strong, round, and very smooth. A lot of braided lines have a square profile to them, but this line is quite the opposite. One of the first things you notice when using this line is how much feel you have. You are very much in touch with what is going on with your lure, and you can feel every contour of the lake, every piece of cover, and definitely every bite, however subtle.Judging by the popularity and reviews of this line alone, it is easy to see that it is one of the most popular braided lines out there. This line handles thick cover quite well, so if you flipping or punching grass mats, this could be a go to line for you. It can pull a fish out of the thick stuff and into your boat in no time, and is resistant enough to handle a beating from heavy cover. As with any braided line, you will probably want to spool a bit of mono line on your reel first before spooling the braid to prevent slippage. I recommend tying the mono to the braid using a double uni knot. 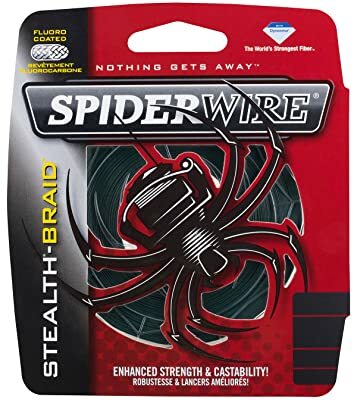 Spiderwire is a very reputable brand, and they offer quite a few different types of line that are great. 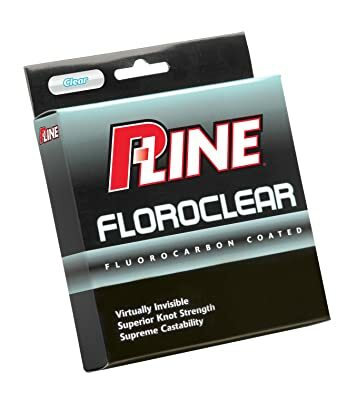 Floroclear by P-Line has a fluorocarbon coating which give it all of the low visibility benefits you would expect from a standard fluorocarbon line. In addition, you get a line that is a bit more workable then a standard fluoro line which is why its one of my favorites. I have found that if you are looking to use Fluoro on a spinning reel, this is a great option. It is much easier to cast than other Fluoro’s, and it holds to the spool much better due to its lack of memory. One of the other unique aspects of this particular line is that because it is only coated in Fluorocarbon, it does not sink. That means, that you get the benefits without the drawbacks of a standard sinking fluoro. If you are looking for a line that can be fished a number of different ways (topwater, finesse, spinning reel, baitcaster, etc) this could be a really great option for you. 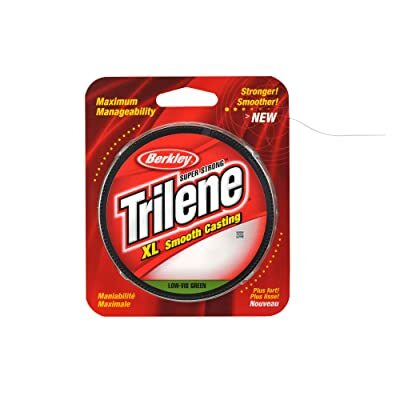 Berkley Trilene is a must have for any mono setups. I’ve been using this line for over a decade now, and it is my most trusted mono line for sure. It has good strength and its easy to cast. I never have any issues with spooling, kinks, or birds nest when using this line. That one of the great things about it – its not fancy, its not flashy, it just works. And it works every time. I’ve fished this line with every single bait out there – plastics, reaction baits, jigs, you name it. When I first started fishing, we weren’t bringing 10 rigs out there with us to fish. It was me and my one spinning reel tacked onto a medium action 6’6 rod. That was it. And this line handled it quite well. Don’t get me wrong, is there a better line for certain fishing situations? Absolutely. But if you are in a pinch or are throwing on one rig all day, this line can handle just about anything you tie on. Of course, it doesn’t hurt that this line is cheap. This line is probably one of the lowest $/yard lines you can find, and you can get it without sacrificing quality. Now that you’ve heard from us and can see all of the fishing line options that are out there for you, its up to you to find the one that suits your fishing needs best, and is within your price range. Of course, technology is advancing so quickly that there are new lines being put out every year so we will update this page as we review additional types of line. If you feel like there is a line that we have missed, drop us a message via the contact page and let us know!